Image credit: © Shaylib from Flickr. Some rights reserved. Pelage: Course, wiry hair; shade ranges from pale brown to near black. Males with long, thick mane that extends to the shoulders. Bright red, bare skin on the neck and chest shaped as an hour-glass. Buttocks hairless and calloused. Range: Central Ethiopian plateau. Distribution bound by the Blue Nile River to the west and the Wabe Shebelle valley to the south. Three regionally isolated populations; the primary population inhabits the area south of Lake Tana and east of the Takkazzé River. Habitat: High montane grasslands; never far from sharp escarpment edges, which provide shelter from predators and serve as locations for sleeping. CITES Status: Appendix II (UNEP 2018). Population in Wild: No recent population surveys. Very rough estimates of 200,000 individuals. Locomotion: Terrestrial animals walk and run quadrupedally along the ground. Scoot with hindquarters along the ground while foraging. Activity Cycle: Diurnal. In morning, ascend cliff-face to tops to feed. Travel slowly to feed along ridges before descending the cliff-sides to seek shelter and sleep at night. Social Groups: Form stable social groups. One-male units (OMUs) or harems are composed of a single, adult male, several mature females, and their offspring. Sub-adult and adult males without females form all-male groups whose members cooperate to harass OMU leaders. Diet: Vegetarians; primarily consume grass. Predators: Few large carnivores within the species' distribution. Leopard (Panthera pardus), spotted hyena (Crocuta crocuta), humans and domestic dogs. Raptors may prey on the young. Sexual Maturity: Males c. 8-9 years; females c.
Longevity: In the wild, 14-15 years; oldest individual lived for over 35 years in managed care. Tough, baboon-like monkeys make their living on the steep cliffs of the Ethiopian Highlands. Bright red patches of bare skin on the throat and chest add to the animal's distinctive character. Have an unusual diet, which closely resembles that of a horse. Family units of up to 1,200, are composed of a single adult male, two or more females and their offspring. 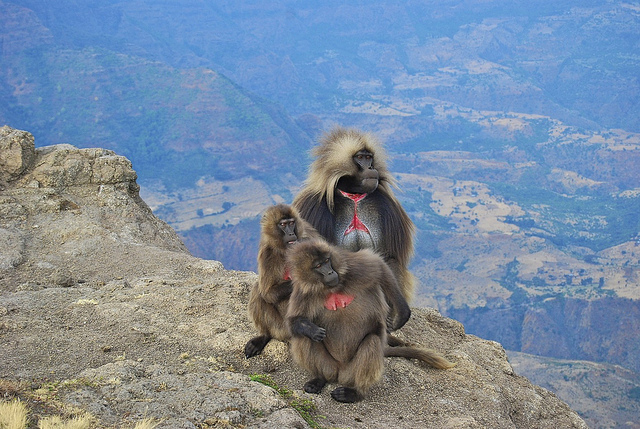 Civil war makes scientific fieldwork in Ethiopia difficult; much about geladas remains unknown. © 2015 San Diego Zoo Global. How to cite: Gelada (Theropithecus gelada) Fact Sheet. c2015. San Diego (CA): San Diego Zoo Global; [accessed YYYY Mmm dd]. http://ielc.libguides.com/sdzg/factsheets/ gelada.